This is a 15 x 7 inch flap. 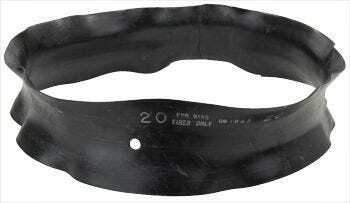 A quality rim liner will extend the service life of inner tubes. Tube liners, also known as tube flaps or tube boots, are used to protect tubes from wear, heat, and other irregularities in the rims. Typically used on split rims, two-piece rims or vehicles with wood spoke wheels. These flaps are designed with high quality rubber, made for durability and are available in many sizes. We recommend new tube liners when replacing tires. Speak to a Tire Expert for assistance with your order. We have some spoke rim #205/70R15 on our street rod. Air is seeping through inner spoke mount - leaking from the rim. Will the 15X7 flap correct this? If you have wire spoke rims that you are running tubeless, a flap will not correct this. Only installing a tube or having the rim professionally resealed will stop the leaking. We will need more information in order to properly assist you. Please contact us at 1-800-251-6336, or support@coker.com.